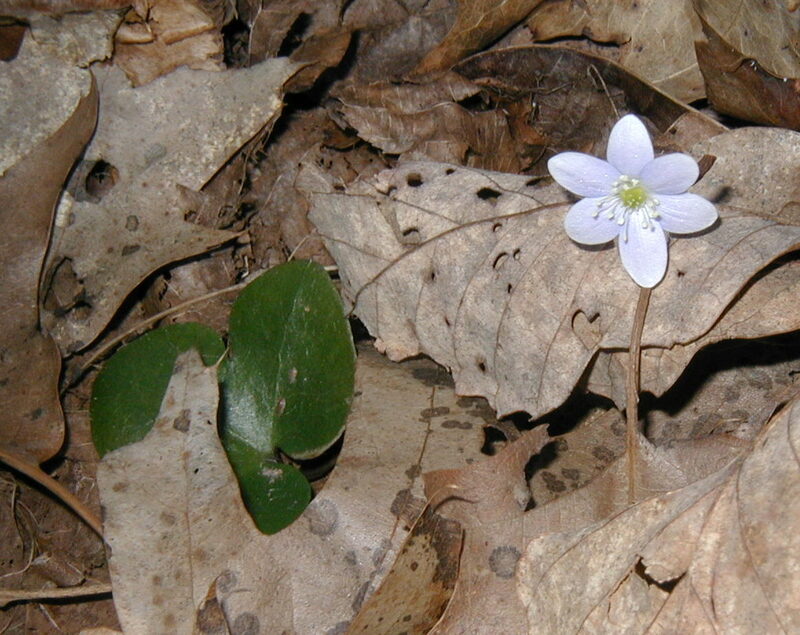 On March 31st the Round-lobed Hepatica, Hepatica americana, were blooming strong. I counted 13 hepatica plants on the south east quad, west and south of the original found plant at the moss-covered skinny log. I think I may have been in the woods at the right time to see so many plants. 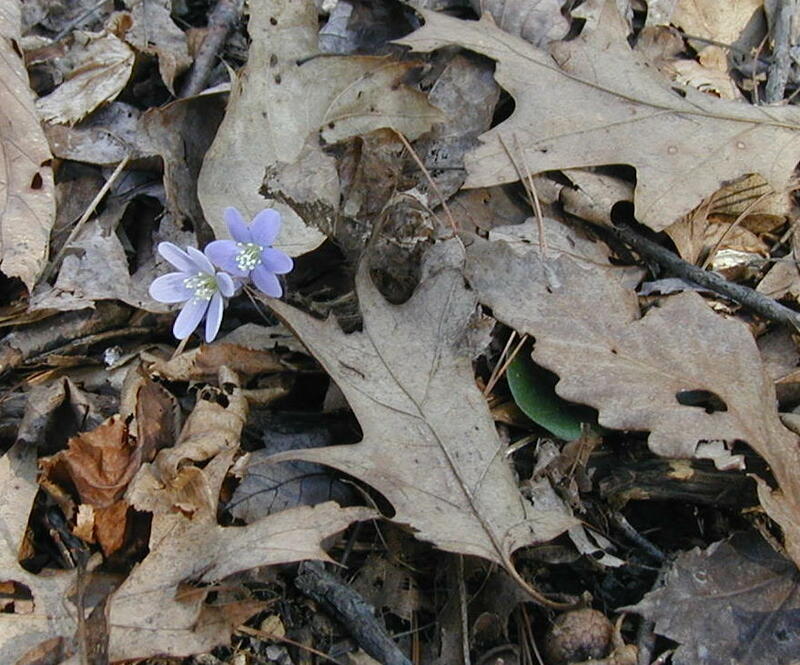 All it takes is a little wind for the oak leaves to cover up the hepatica and hide it from us, so make sure to look well among the leaf litter for it. The previous two days were cloudy, overcast, windy and rainy. The delicate forest flowers must need at least a little sun to coax their blooms out of hiding. After all, they only bloom once in a year and when they do bloom it’s during the time when there are no leaves on the trees. Leaf buds are pushing a little on a few trees, like the cherry trees and lilacs, but for the most part the scenery is still drab shades of gray and brown accented with flowering forsythia and star magnolia. Hepatica photos taken 29 March 2010 show the flower buds getting ready to open. Photos in this post – all photos taken 31 March 2010 – show blossoms opening up. Round-lobed hepatica with white blossoms. 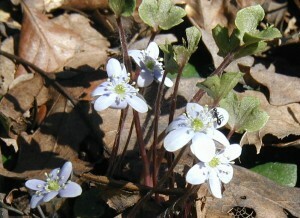 White flowers are opening up on this round-lobed hepatica. It’s an older plant with at least seven leaves and as many flowers. (Click images to see larger view.) Note that the petals are shorter than the bracts under the flower head. Young petals are smaller than the bracts. As the flower matures the sepals get larger until they are about the same length as the bracts. The Peterson Field Guide to Wildflowers tells us the petals are actually sepals. 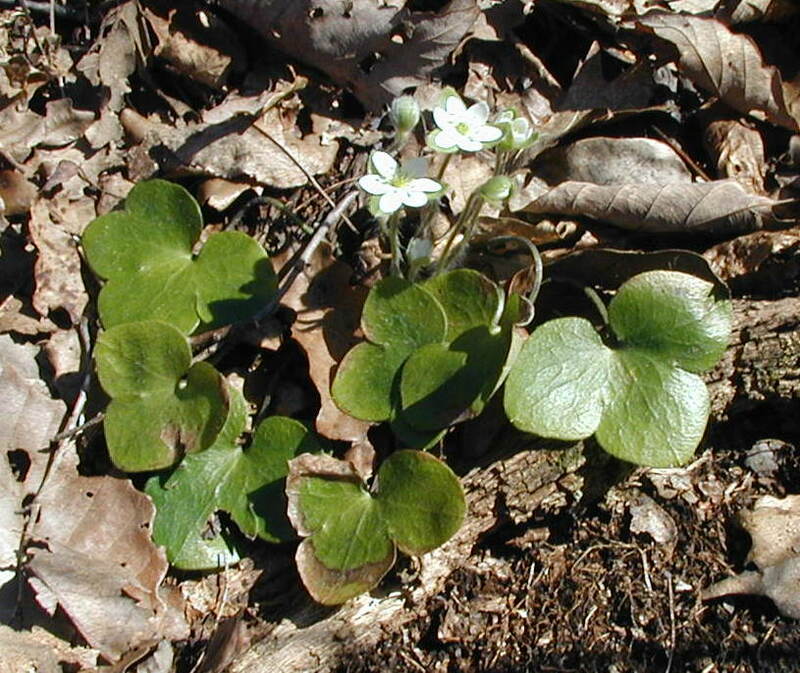 Round-lobed hepatica plant with only two leaves and two flowers. The true colors of the two blossoms above are pale blue. The waxy surface of the leaves can be seen here as a shiny surface. In real life the flowers were a much deeper blue to purple color, but the sunlight – and a flash on the closeup images – washed out the color. 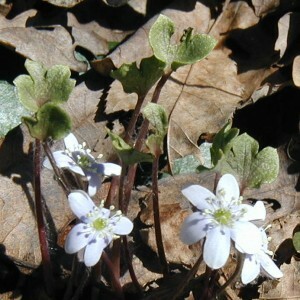 The afternoon sun shone on the hepatica flowers softly, but the images from my little digital Olympus were overexposed. Can’t wait to get a manual everything camera. 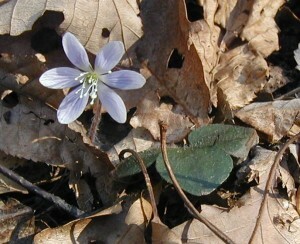 Round-lobed hepatica with purple flowers. 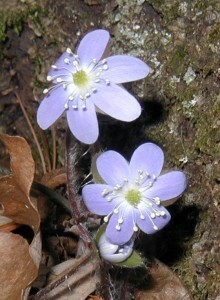 Closeup of light purple round-lobed hepatica flowers. This plant grew at the base of a big oak tree, so it was easy to find it again. Use landmarks around you to re-locate plants that you want to observe throughout the year. Round-lobed hepatica with small upright leaves. Note angular features of small leaves. This older hepatica plant, as noted by the many leaves and flowers, has a set of smaller, upright leaves. The upright leaves are not rounded on the edges, but rather pointed or angular and about the same size as the flowers. 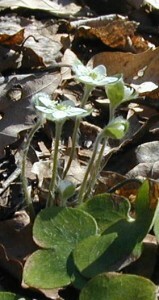 Closeup of round-lobed hepatica upright leaves. Closeup of smaller, upright leaves shows they are taller than the flowers. Why are these leaves held upright? Are they young versions of the mature leaves that overwinter or do they have a different purpose? Several of these smaller leaves are deformed or have been nibbled on. Not many of the larger, rounded leaves are so deformed, but there are a few leaves that are torn or damaged that survive from year to year. 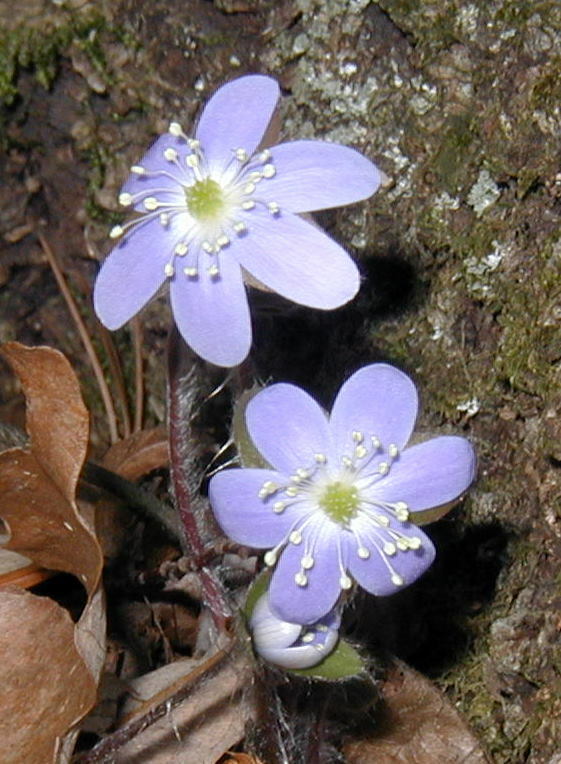 Perhaps mammals of the forests that browse on the small leaves help to pollinate hepatica. Round-lobed hepatica with ant on flower. Here, we see that ants are likely pollinators of round-lobed hepatica. Note the fuzzy appearance of the flower stems and the tight anthers on the cream-colored stamens that stick out like little lights. 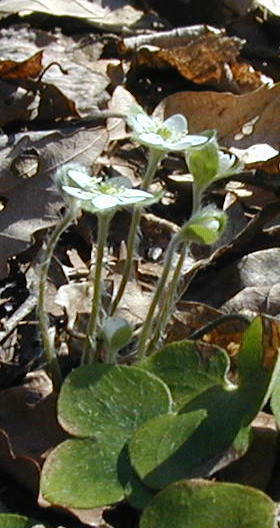 Fuzzy stems of round-lobed hepatica flowers. Flowers don’t all blossom at one time. In the image above there are two fully-developed flowers with their petals held out flat, one flower about to open, two with bent heads and flower stalks almost tall enough, and one with a short flower stalk and tighter flower bud. Note the hairy stems and bracts. The hairs are quite long in places, making the flower heads and stems appear fuzzy. Hairs on leaf of round-lobed hepatica. Leaves are hairy as well. Older leaves may lose some of the hairs, which are not as long as the hairs on the flower stems. When you’re taking a walk in the woods searching for hepatica and other Spring ephemeral flowers, stop every now and then and scan the leaf litter all around you. Look for any bit of green on the forest floor and if there is a well-rounded edge to the leaf inspect it a little closer. At times you will find the flower poking its head above the leaf litter while the leaves that have overwintered are still under cover. 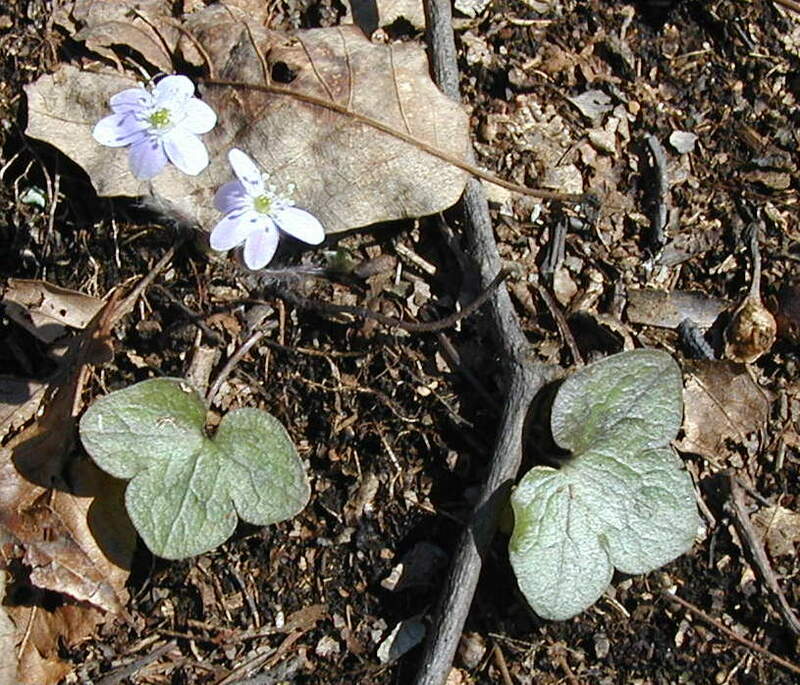 This has led to some field guides to state that hepatica flowers will appear before the leaves do. Actually, the leaves are there too, just not completely visible. 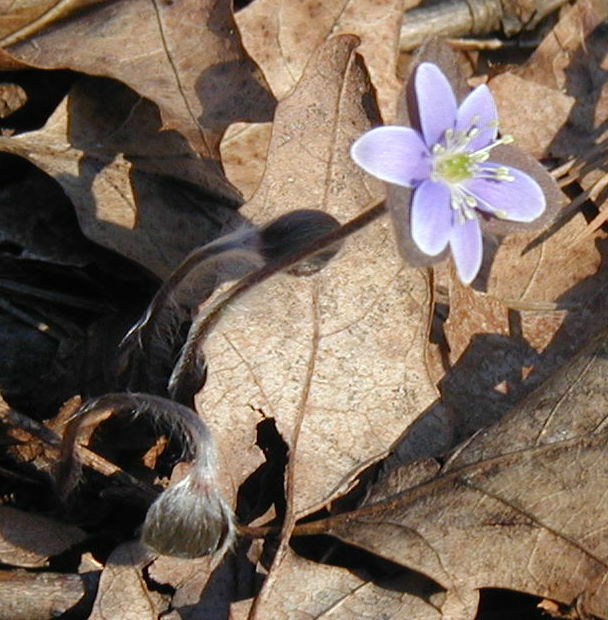 Round-lobed hepatica flowers with hiding leaf. 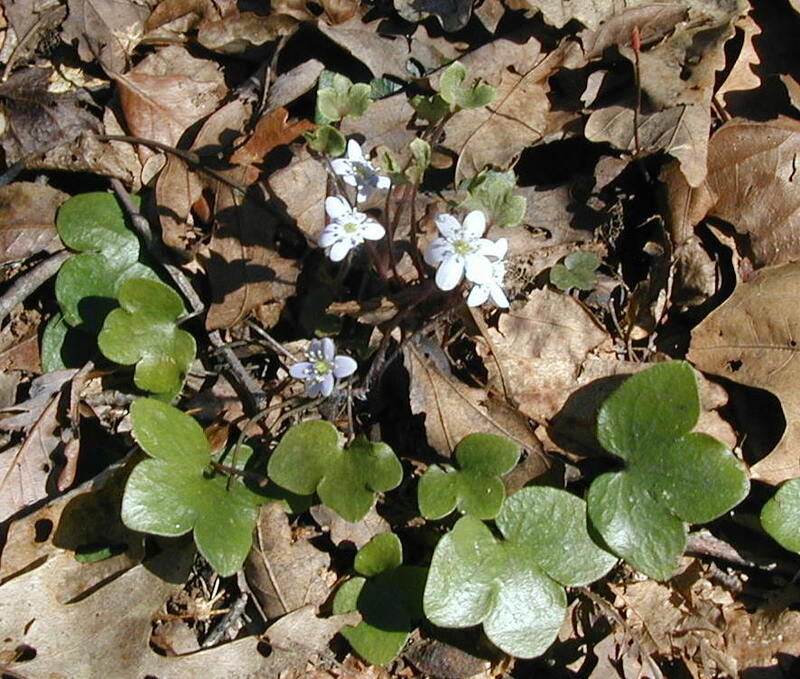 Typical view of hepatica with the flowers sticking above the leaf litter and the leaves hidden below the oak leaves. Round-lobed hepatica with single leaf and flower poking out of the leaf litter. Three bracts underneath the flower heads are either green or maroon, hairy, and rounded at the tips. 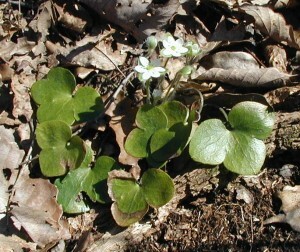 Round-lobed hepatica with maroon bracts. This plant has two flowers in the bud stage and a young opened flower that appears to be supported by the three maroon bracts beneath the open flower head. Not all hepatica plants were flowering on this day. I suppose they don’t flower each and every year, or perhaps those without flowers had already bloomed. At the most the plants that I saw had two blossoms full out per plant, some had only one or no flower – at that particular time. A couple plants had already flowered and dropped their petals, while more blossoms are yet to fill out.